The ADXL50 is a complete acceleration measurement system on a single monolithic IC. Three external capacitors and a +5 volt power supply are all that is required to measure accelerations up to 50 g. Device sensitivity is factory trimmed to 19 mV/g, resulting in a full-scale output swing of 0.95 volts for a 50 g applied acceleration. Its zero g output level is +1.8 volts. A TTL compatible self-test function CAN electrostatically deflect the Sensor beam at any time to verify device functionality. For convenience, the ADXL50 has an internal Buffer Amplifier with a full 0.25 V to 4.75 V output range. This may be used to set the zero-g level and change the output sensitivity by using external resistors. External capacitors may be added to the resis- tor network to provide 1 or 2 poles of filtering. 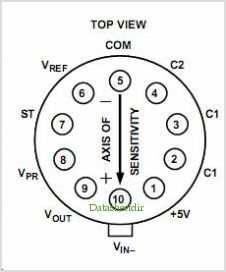 No external active components are required to Interface directly to most Analog-to-digital converters (ADCs) or Microcontrollers The ADXL50 uses a capacitive measurement method. The ana- log output voltage is directly proportional to acceleration, and is fully scaled, referenced and temperature compensated, resulting in high accuracy and linearity over a wide temperature range. Internal circuitry implements a forced-balance control loop that improves accuracy by compensating for any mechanical Sensor variations. The ADXL50 is powered from a standard +5 V supply and is robust for use in harsh industrial and automotive environments and will survive shocks of more than 2000 g unpowered. The ADXL50 is available in a hermetic 10-pin TO-100 metal CAN specified over the 0C to +70C commercial, and 40C to +85C industrial temperature ranges. Contact factory for avail- ability of devices specified for operation over the 40C to +105C automotive temperature range. By Analog Devices, Inc. This is one package pinout of ADXL50,If you need more pinouts please download ADXL50's pdf datasheet. ADXL50 circuits will be updated soon..., now you can download the pdf datasheet to check the circuits!